Breakfast can quickly turn into the most monotonous meal of the day, especially if you have a rushed morning trying to get out the door to work and dropping the kids off at school. As part of Target's Busy Family Event, I was sent a package of ingredients to transform into simple breakfast treats to switch up your family's breakfast routine. 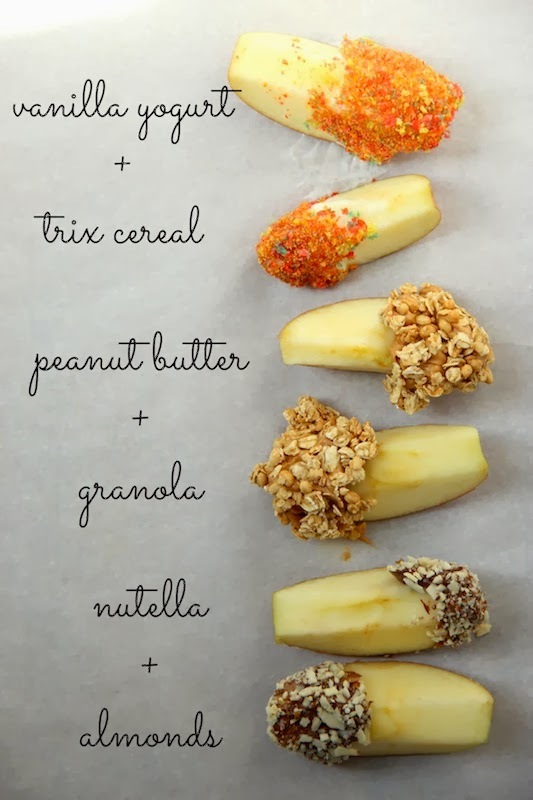 I sliced apples and dipped them into various toppings for a quick breakfast or snack that kids will love. I liked the combinations of vanilla yogurt + crushed Trix cereal, Jif Peanut Butter + Nature Valley Protein Granola, and Nutella + crushed almonds and flax seed. You can see more great breakfast ideas from Target's Busy Family Event below. such a great idea! would be awesome with bananas, too. These are awesome ideas Sherri! I would have never thought about these; I will have to try some of these tmw for breakfast! Yum-o!